No matter how you define monsoons, a romantic staycation in the rains is a must for the season. Relax, rejuvenate and rekindle your love at these 5 stunning staycations near Pune that are just as good as the weather. Located at Nane Road, next to Sadik Watch House in Kamshet, Firdaus Baug is about one-and-a-half-hour from Pune via NH48 through Kusgaon Road. It’s a heritage Parsi villa with bedrooms beautifully done up with poster beds, bright curtains and antique decor. The bungalow also has a well-manicured orchard, an outdoor setup with swinging chairs by the Indrayani river and an indoor game-room with table tennis and carom. Additionally, there are verandas too, furnished with charming patio chairs and long wooden benches. The villa has four rooms that can easily accommodate 12 guests. Price per night at Firdaus Baug is INR 19,971. For bookings and more details, get in touch with Tejas (host) here. Prana is a four-bedroom poolside villa in Alibaug that seems like the perfect destination for a monsoon getaway. The property can accommodate about 12 people in total. 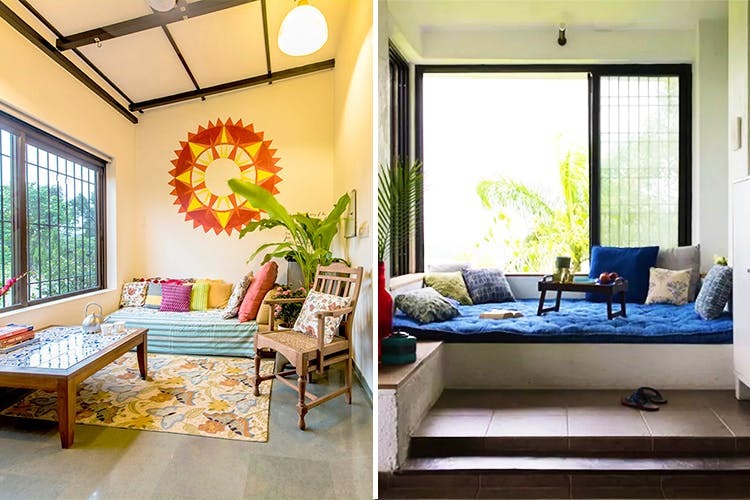 We hear the villa is beautifully done up with rooms that have teak poster beds, full-length glass windows, beige walls, cocoon chairs and gorgeous South Asian artefacts at every nook-and-corner. What’s more? It also has open-air bathrooms, a mini library, a game room and spacious balconies decked up with recliners. The best thing about Prana is undoubtedly the swimming pool. There are comfortable lounge chairs by the pool where you can sit for hours with a book (when the weather is right). For more details, get in touch with the host here. Bungalow 89 is located at Khondagewad in Jalvaayu Marg, right next to Bhushi Gaon in Lonavala. It’s a gorgeous property, perched on a hill with lush greenery and misty blue skies as the backdrop. What we loved the most about Bungalow 89 is its location – quiet and secluded; apt for a much-needed digital detox. The top views of vast valleys are simply breathtaking, something out of a postcard from a foreign land. The villa has three bedrooms, spacious enough to accommodate a group of 10 or more. The balcony is our favourite. It has a beautiful swing and it overlooks the Bhushi Dam. In other words, one can sit there with a book and let the hours pass by. For more details, click here. Rustic and luxurious, Tooth Mountain Farms is a boutique farmstay, located next to ND Studios in Karjat. Perfect for a quick monsoon getaway, the place has 5 suite-style rooms that can accommodate about 18 people. What’s interesting is that every room has a unique theme. For instance, one of the rooms, Parijat, depicts the night-flowering jasmine while Ashmantak is designed to represent gorgeous purple orchids. The property also has a lap pool, manicured lawns, football field, bicycle track and a bonfire set up in the garden. For more details, click here. Coco Shambhala in Sindhudurg is a group of four Balinese-style villas that has its very own infinity pool. Every villa represents a theme, however, our favourite is Villa Varenya, which has the best sea views ever. We hear each villa can accommodate about 5 people at a time and offers maximum privacy, with no intrusions from staff except for meals.As for the food, their menu is seasonal and has best of Goan cuisines curated by Shagun Mehra. For more details, contact the property here.